Not overly sweet, just sweet enough which allows the peanut butter to really shine through, these cookies quickly became a new favorite. Once baked the cookies remain soft after a couple of days (if they last that long!). Justin and I both prefer a softer cookie versus a crunchy cookie. 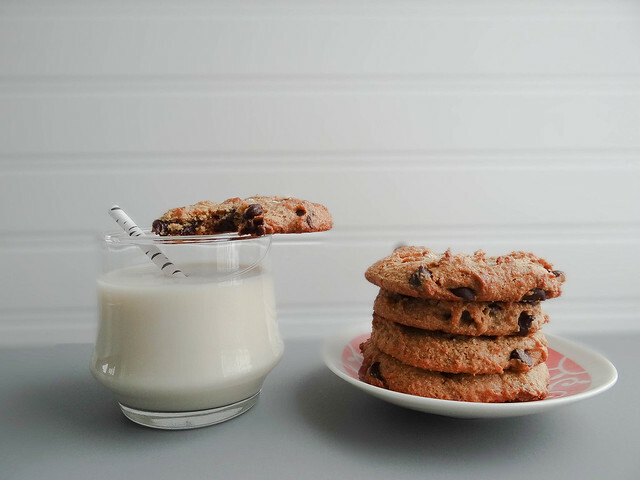 Speaking of cooking dunking - I use to love the cookie crumbs that would fall to the bottom of the glass to be gobbled up at the end of a dunking session. 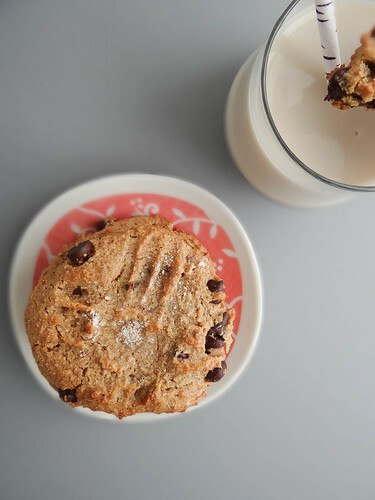 It was always a bummer though when half my cookie would fall into the milk from an over zealous dunk, then you would be fishing for your cookies instead of dunking. What was your fondest cookie memory growing up- do you love cookies just as much as Justin and I do? 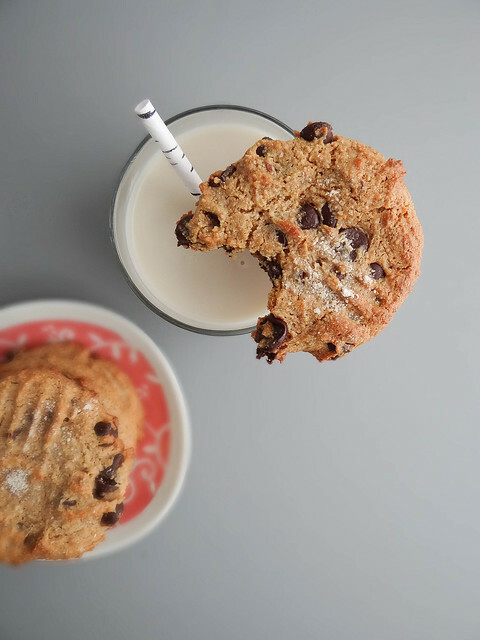 Are you a cookie dunker? In a mixing bowl add flour and baking powder - mix well. Add peanut butter through vanilla extract and stir until dry ingredients are well moistened. Fold in dark chocolate chips. On a cookie sheet drop dough by the tablespoon (I used 2 cookie sheets, 6 cookies per sheet). 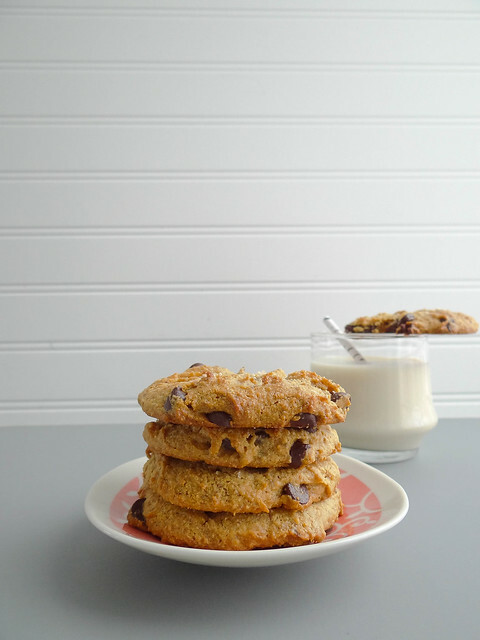 With the tines of a fork dipped in flour press a criss cross pattern on the cookies. Bake in a 350* pre heated oven for 10-12 minutes or until cookies begin to turn golden - rotating cookie sheets half way through baking. Remove from oven and allow to cool on cookie sheets. Store in a airtight container for up to 3 days. these look marvelous! 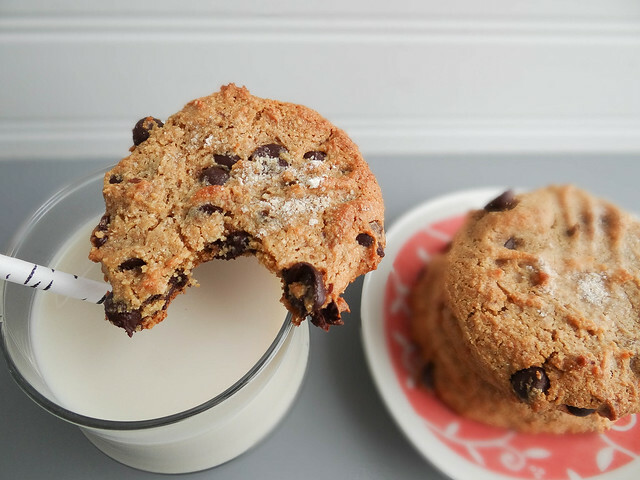 i think cookies are the perfect dessert, because they are little servings of something delicious. i remember eating chocolate chip cookie dough when my mom and i made cookies, too. now, it's definitely worry free. i was never a dunker, though. I am definitely a dunker who also prefers soft cookies! These pictures are great! Your photography has gotten so impressive in the last few months! And that straw, I swoon. You are the SWEETEST Shannon :)....aren't those straws awesome, gotta love etsy! 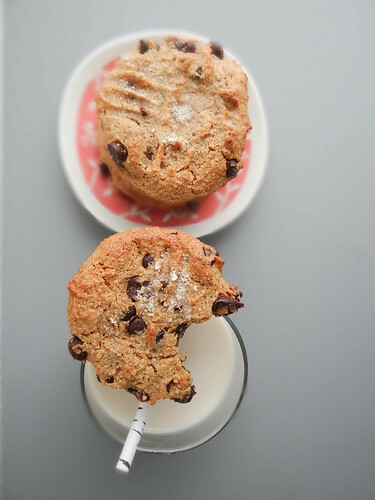 I'm totally a cookie dunker and when younger I had specific cookies for said dunking- nothing was worse than a cup to small to fit the whole cookie in! All of those cups belong to my parents though, I still need to invest in a new one myself ;) Speaking of which those cookies are ginormous and that is awesome :) Perfect flavour combo too! Just made these! They are great! Thank you so much for sharing this recipe! Those cookies look perfectly soft and chewy! I'm not really one to go for cookies as a treat, but I do enjoy a good peanut butter cookie. 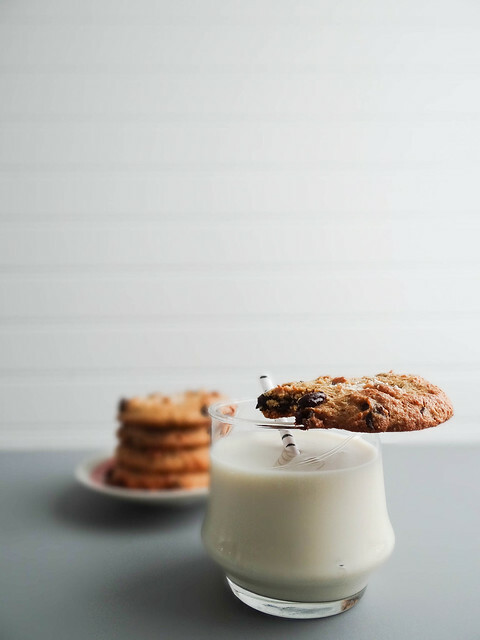 I never used to dunk my cookies either until I went to India and everyone did it there - it has to be a crisp biscuit dunked in milky chai for me to like it! Thanks for the feedback Somer! I made a note on the recipe- LOVE the idea of rolling in sugar- genius! These sound amazing! Definitely on my to-do list. Thanks for the recipe! That might be the most romantic cookie post I've ever read :) And I agree with what VeganFling said above- I love that you can eat the dough cause it's veegan! I sure wish I had one of these for dessert right now! Damn they looks so yummy. Is there a gluten free version you recommend? this looks absolutely delicious.